On the most exciting trip home from work ever! 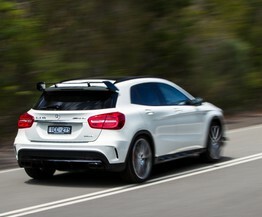 I freakin' love the Mercedes-Benz GLA45 AMG. 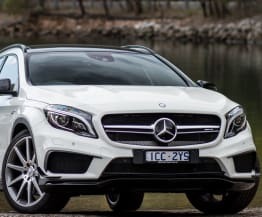 When I first looked at it, having never driven a GLA45 AMG before, I thought it looked like an ostentatious, overdressed, in-your-face, strange looking, confused cross between a large hatchback and a small SUV. That's pretty much exactly what it is, but it's also awesome. A windy mountain road would be epic - windows down so you can hear it pop and crackle as you tackle some hairpin turns and long corners. That being said, even my trip home was a lot of fun. Traffic wasn't too bad, and when you look forward to hitting a red traffic light just so you can take off, you know its a silly, fun car. A quick up or downshift on the paddles, coupled with a jab on the throttle is enough to scare the crap out of pedestrians too. Really, really, ridiculously good-looking both inside and out. 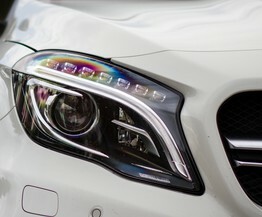 It's got a 265kW/450Nm 2.0-litre four-cylinder turbo engine (also found in the A45 AMG and CLA45 AMG) teamed with a seven-speed automatic sports transmission, as well as sports tuned suspension and Mercedes-Benz 4MATIC all-wheel drive. 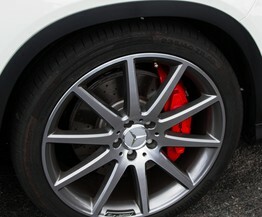 Plus those 20-inch alloy wheels and red brake callipers look fantastic. Gorgeous. 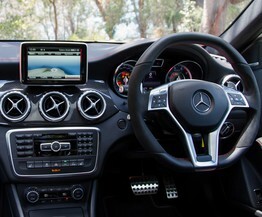 The AMG design language adds things like red seat belts, illuminated door sill panels emblazoned with "AMG", leather sports seats with red stitching that are surprisingly comfortable and instrument cluster with racetimer as well Harman Kardon Logic surround sound system with 12 speakers, satellite-navigation, 10GB of music storage and digital radio. My favourite feature was the steering wheel. 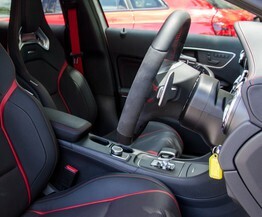 It's covered in super soft black nappa leather and Alcantara, and it felt so amazing it was hard to keep my hands still. It is that soft and feels so good - I want a pillow made out of it! It's fairly spacious, considering it's still a small car, with 80-litres more boot space than the A-Class at 421-litres. It's loud and road noise emanates through the cabin while the ride is quite firm. Though it's grippy through corners and maintains body control. The GLA45 is a strange breed of crossover in that the ride height is more than a hatch, but not quite where you want it to be. It's also a little frustrating to drive around the city, it seems to scream to be let loose on a long, open or windy road. Though it could handle a small family, I'd say the noise and the type of driving it inspires wouldn't be well-suited to children. The three-year/unlimited kilometre warranty is certainly not market leading so be ready to fork out if you want to hold onto it once the warranty period is up. 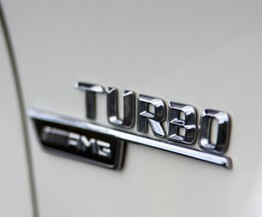 Mercedes-Benz claim a combined fuel consumption figure of 7.5 L/100km, again that's not too bad but certainly not frugal. Not if you can handle the noise and the punchy engine. I enjoy driving a car with a bit of character so it's certainly a contender for a long-term relationship. Being a mum, I need something with space because you never know what will be thrown at you and I thought this would feel too small but it's surprisingly deceiving. There's only really one true competitor in this niche space, the Audi RSQ3. The Mercedes-Benz GLA45 is for those that like to have fun whilst doing some serious driving. It behaves a bit like a sports car, but has the practicality of a small SUV. An interesting combination that's not for the faint-hearted or those that want to blend-in on the road.